Welcome to a world full of scuba diving destinations! Once a diver always a diver looking for your next dive! At DRESSEL DIVERS we have what you are looking for. Our dive centers are your gateway to a myriad of Caribbean reefs and more. 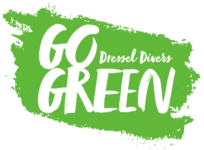 Dressel Divers offers quality scuba diving in many seas and oceans, such as the Caribbean, Pacific, Atlantic or Mediterranean, and also world famous caverns. We offer diving for certified divers of all levels as well as beginners that have never dived before. Scuba Diving lets you connect with nature and excites your senses like few other sports will ever do. Fish will look you in the eyes and hover around you unafraid of your presence like birds will never do. There is nothing like exploring the magic Caribbean underwater world with its coral reefs and colorful inhabitants that accept your presence as if one of them. Reef dives, wreck dives, night, drift, deep, cavern etc., we are waiting for you to come and enjoy it with us during your well-deserved vacation. Leaving from the very palmed beaches or piers facing our dive shops we provide diving trips to many incredible Caribbean dive sites nearby. We also organize excellent dive excursions to more distant reefs by means of half or full day trips. Therefore many of our visitors opt for our specially designed scuba diving packages that facilitate diving more for less with all the best included. We have a selection of offers for you to find a great deal, discount or all-inclusive diving opportunity applicable to your particular interests. The reefs and Dressel Divers are waiting for you. Come visit. Come see!